1 – 4′ x 8′ sheet of hardboard (it comes in 1/8″ or 3/16″ thickness, either will do) Don’t forget they can cut it down for you at the store. 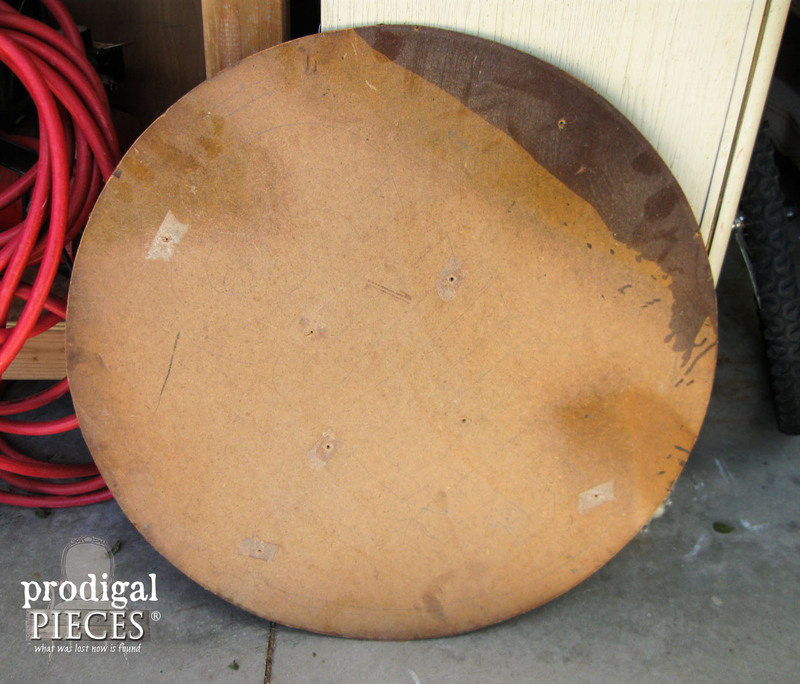 First, you want to cut yourself a 27.5″ (or size of your choice) from the hardboard with your jigsaw. Good news is that you can make several of these from the same board. 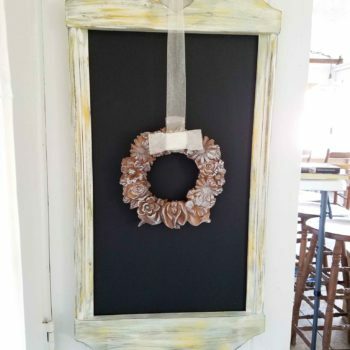 I also use this board to make my chalkboards and other signs too. Since my board was from a mirror, I needed to fill the holes with wood filler. You may need to do that too if you don’t want any imperfections. Now your clock face is ready for the numbers you have already prepared using the tutorial linked above in the materials list. I laid my numbers out and did a visual check leaving about a ½” margin around the outside edge. Paint in the numbers using whichever color you prefer. I used the same color as I did for my base coat. 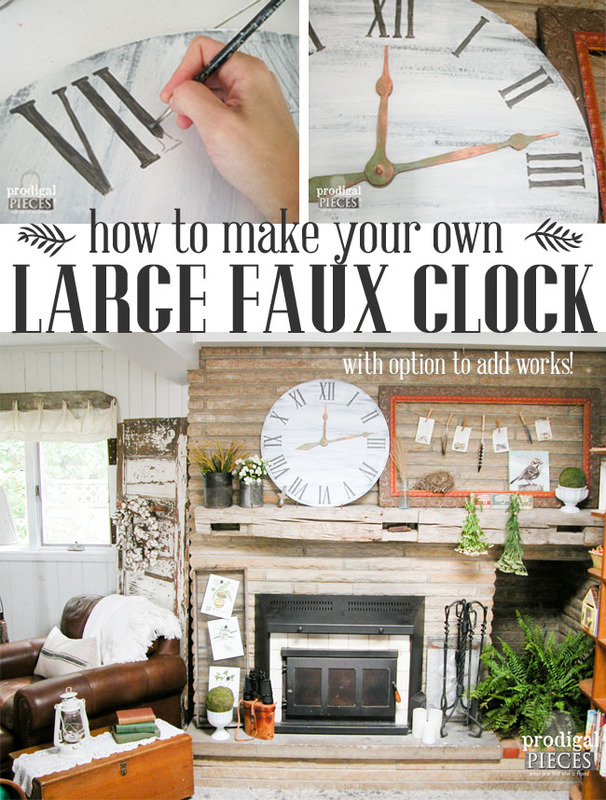 At this point, you can do one of three things: (1) trace and paint your hands on the face (2) buy a clock works HERE to fit your clock to make it actually run as a real clock (3) make some 3-D hands yourself. 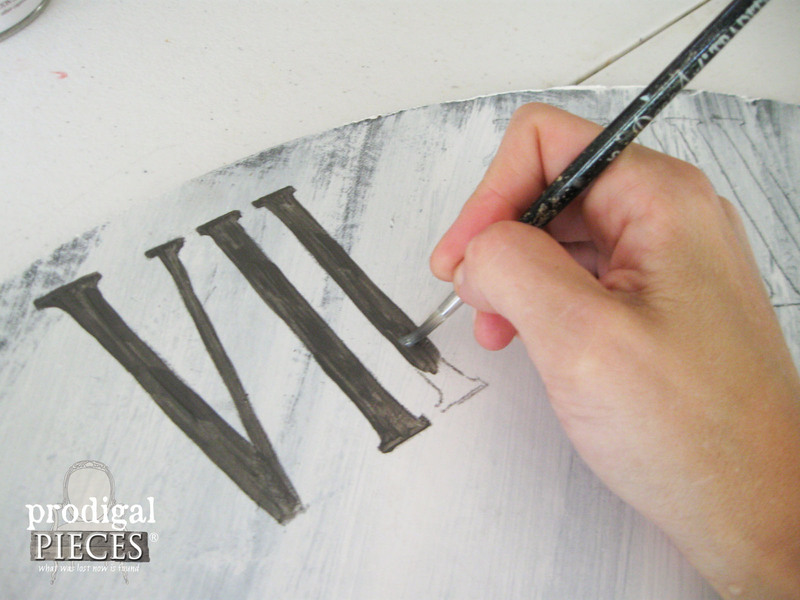 For the option 3, your next step is to create the clock hands using the template you created from the materials list above. 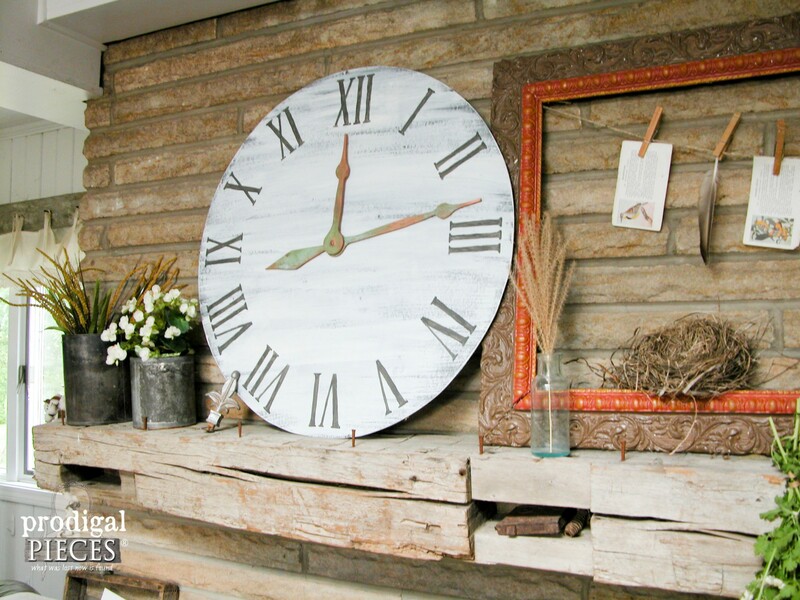 Trace your clock hands onto a piece of your remaining chipboard and cut out with your jigsaw. I can’t tell you enough how much I love my Kreg Clamp Trak on my DIY workbench. 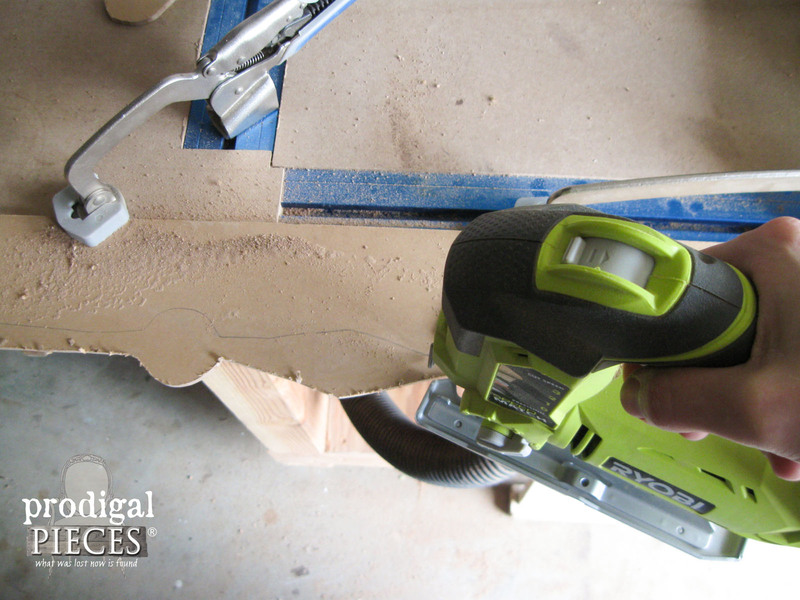 They totally make cutting with a jigsaw a breeze. 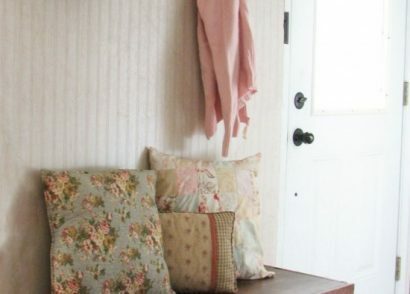 Now, this would be the best time to add any wall mounting hardware before you add the hands or works. To attach it all together, I drilled my clock hands and center of clock with the 5/16″ brad bit, and then used a short length of dowel as a center pin. 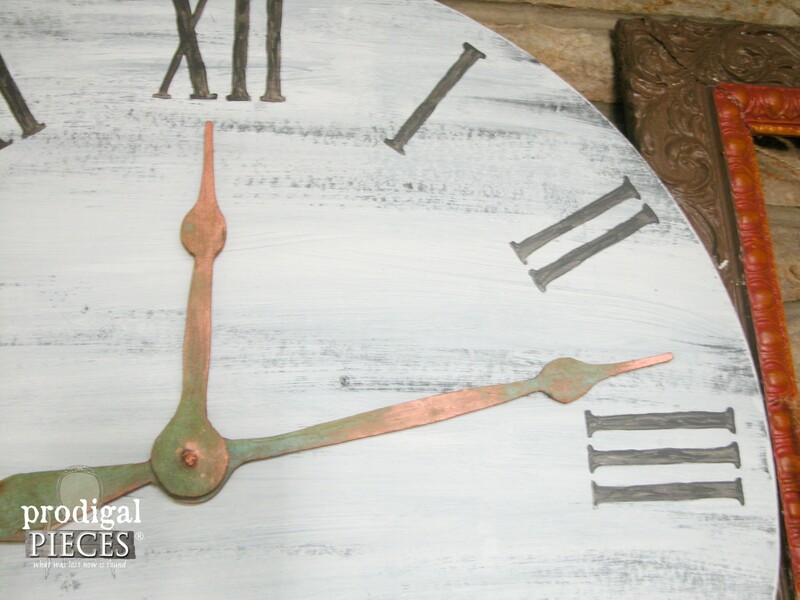 Before you attach them together, paint your faux clock face hands and dowel with the copper metal effects kit. 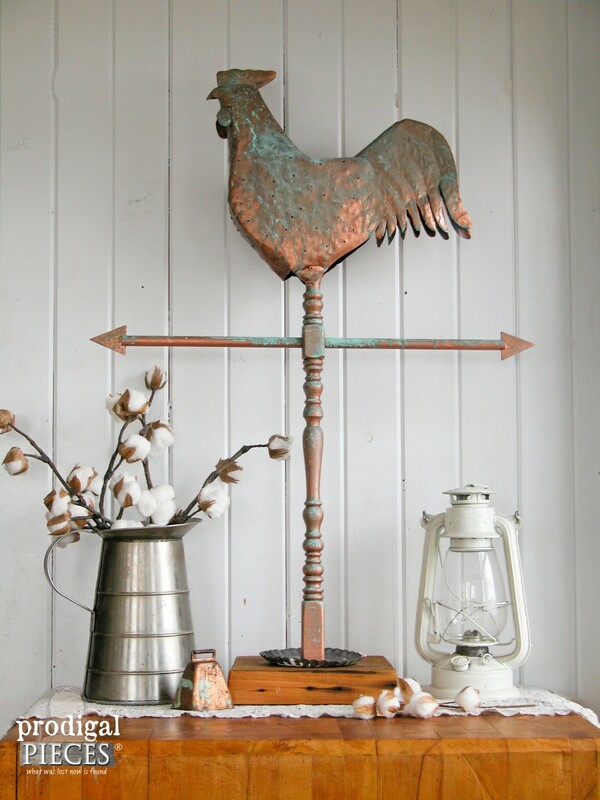 (or whatever color and finish you choose) Also, here is the same copper patina on my repurposed rooster weather vane, and I also used in on this Art Deco vanity. Put it all together and then you’re done! 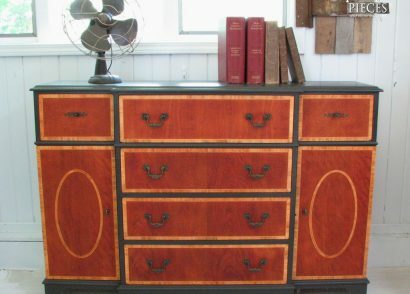 Isn’t that patina gorgeous? I’m slightly addicted. tee hee. 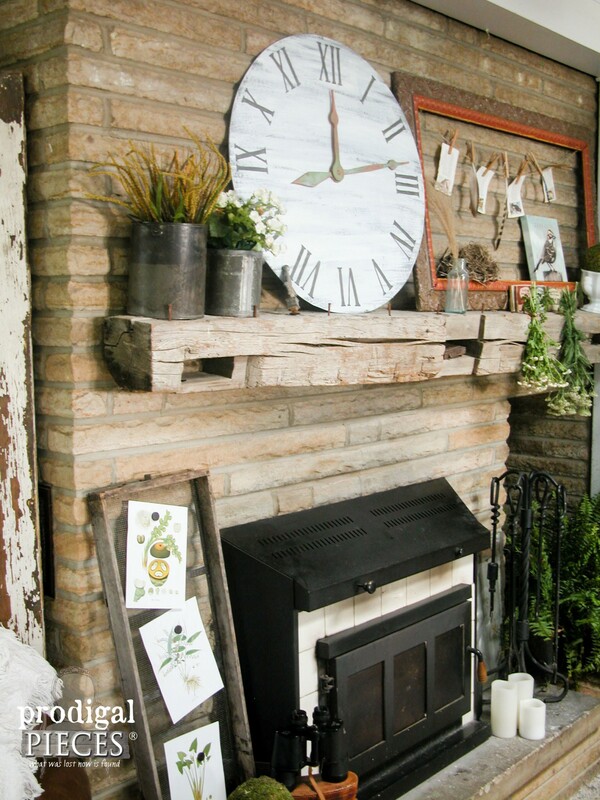 Okay, so I have to tell you that I simply shopped my home to make this mantel. 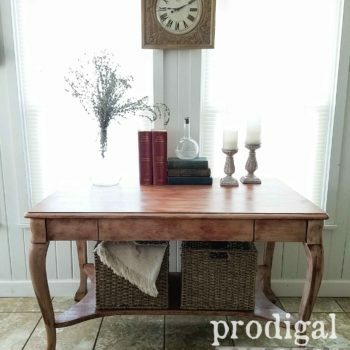 Most everything was either found curbside or cost a few bucks at the flea market or thrift store. 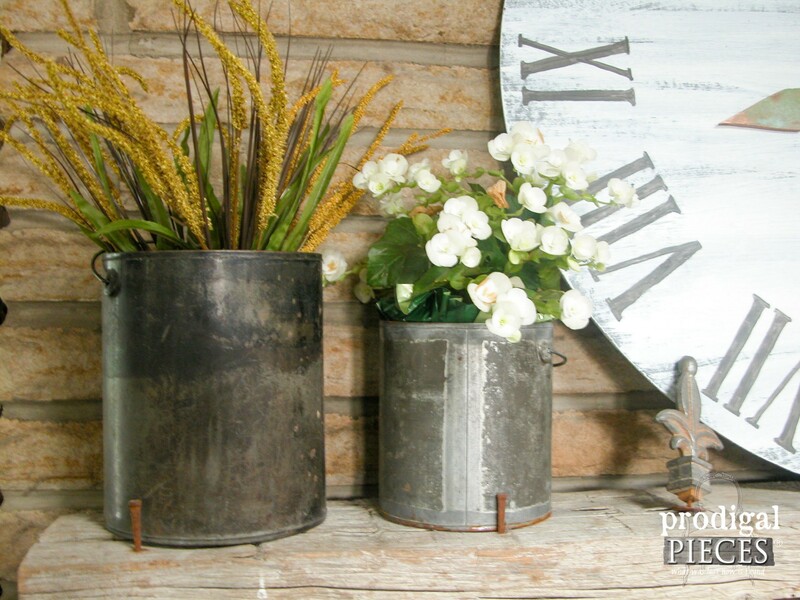 My old paint pails are my favorite planters filled with faux stems from the dollar store and a small plant from a Mother’s Day banquet. 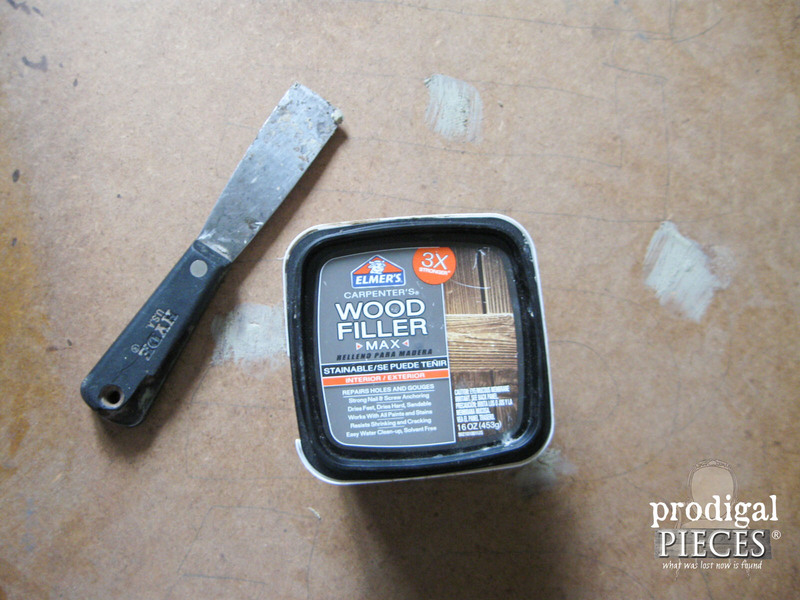 This frame was found during city clean up along with my recent credenza makeover. I think it works perfect with our love for birds. 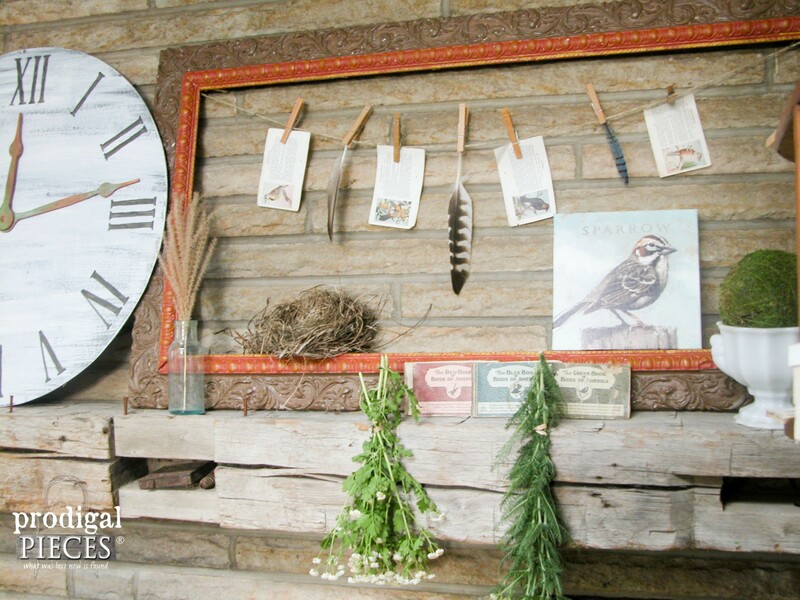 My flea market sifter screen with botanical prints and magnets fills in the gap nicely on the side. I am so pleased with the whole look and hope you enjoy it too. You don’t have to break the bank to create your style. 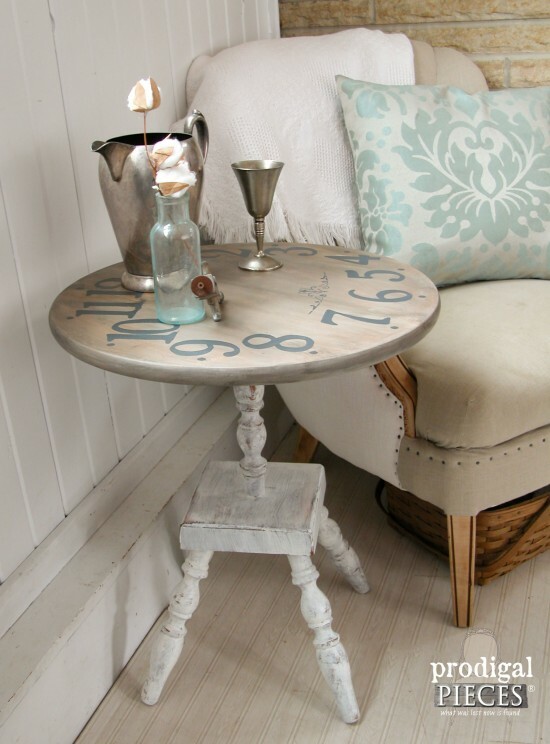 Just get thrifty with it! 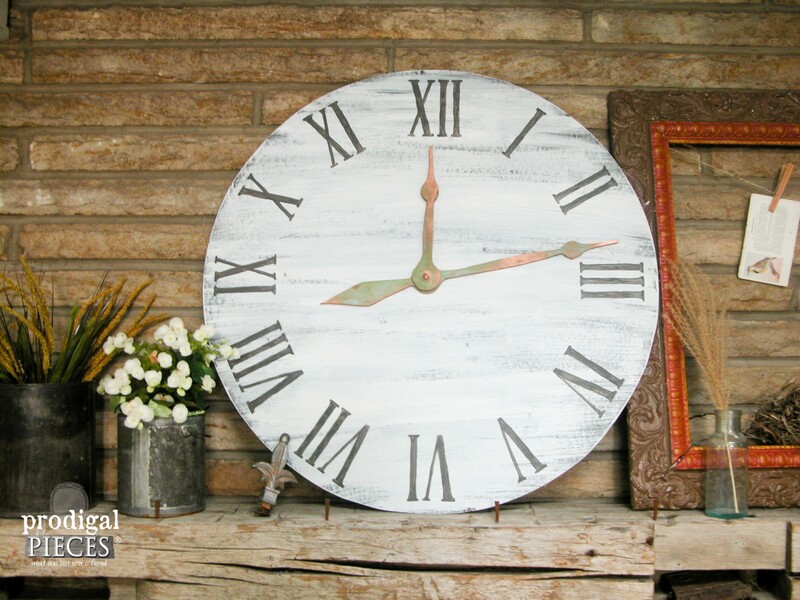 You can find this clock available in my shop if you’re not into DIY. 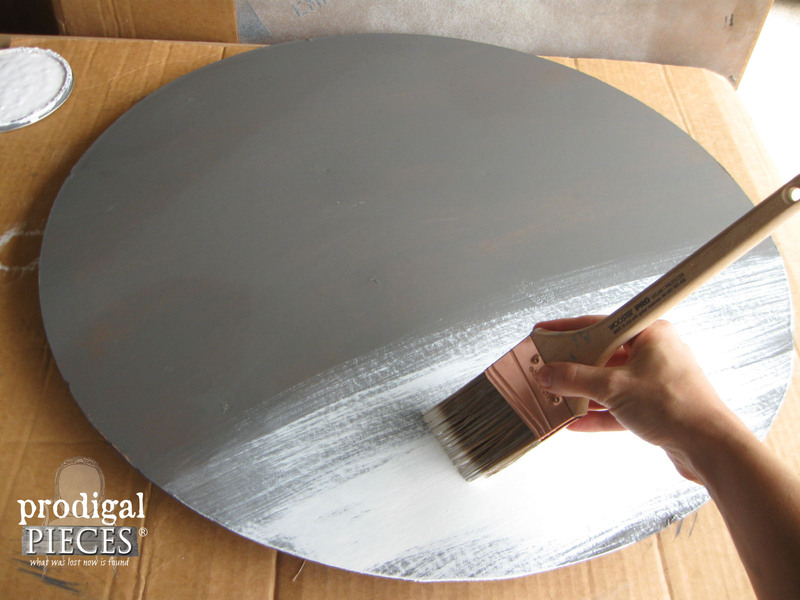 If you love this clock idea, then you’ll also love this faux clock face table my youngest son and I did here from some trashure. 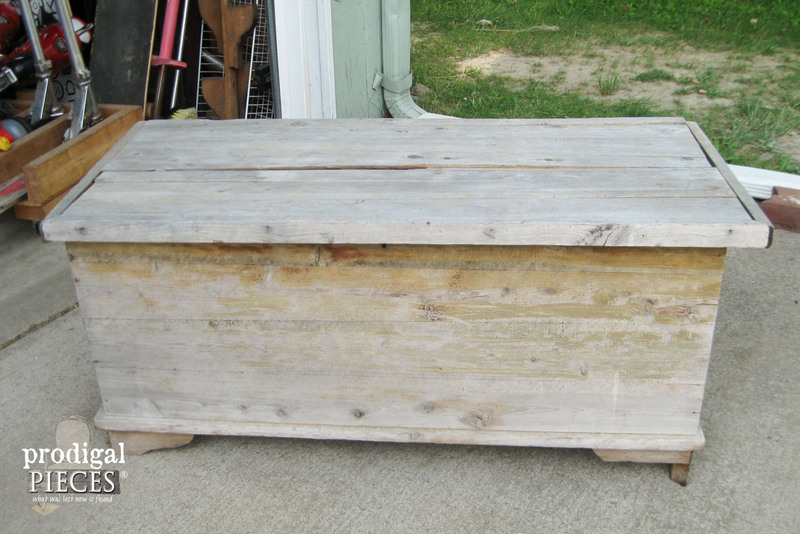 Next week is Trash to Treasure time and I will be giving this cedar chest new life. It was left for dead in the trash and is one of the grossest pieces I’ve had yet. So, do you think I can do it? Come see HERE! That’s awesome! Thank you, Sandra. The clock is wonderful. YOU are wonderful! You just made my day, Sherry. Thank you so much! 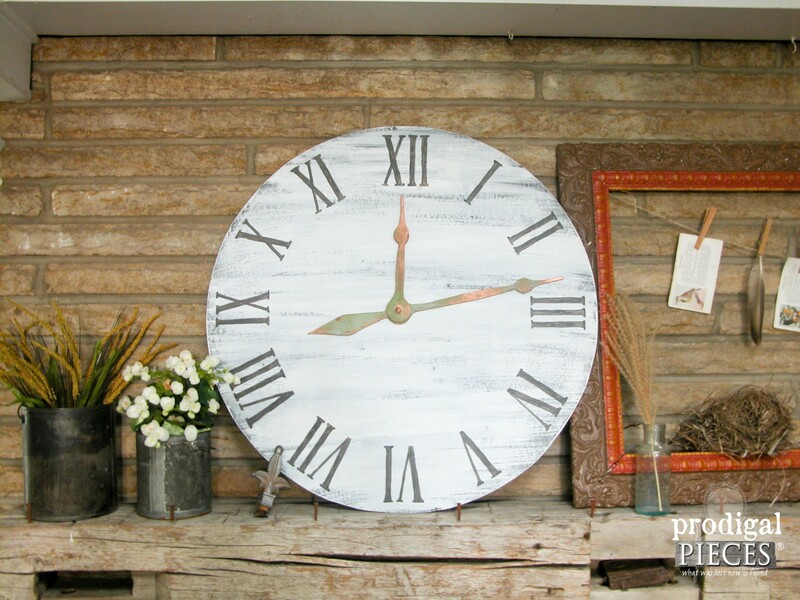 Love the clock! Doesn’t seem too difficult to accomplish either. I think I will give it a try for birthday present f my sister! I have another question totally unrelated. Where did you get your stems of cotton? They look so realistic! The ones I find DO NOT! Very pretty Larissa! I like the light color you used on the clock. It brightens up the whole mantel. Thanks, Mary. 🙂 I am going to give the fireplace a makeover after our kitchen is done. I can’t wait to spice it up! Very nice and as far as the t goes I know you will make it beautiful again I can’t wait to see it. Thank you for the vote of confidence, Lynne! I love clocks, the larger the better. This one you made is a beauty. You did an excellent job. Thanks for your tutorial. I think most people will have to ask for hardboard or Masonite at the hardware store. A lot of places won’t recognize the term chipboard. I love the clock. 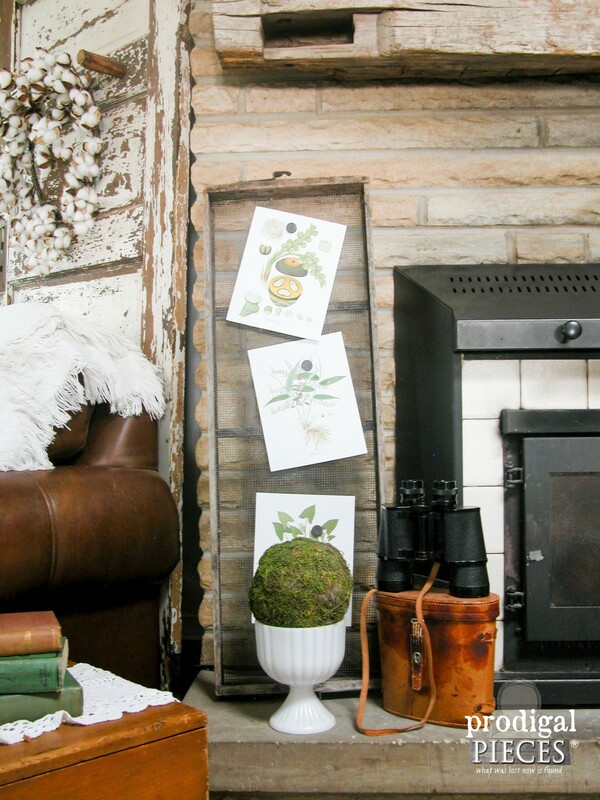 It has presence and looks great on the mantel. Thank you, Debra! 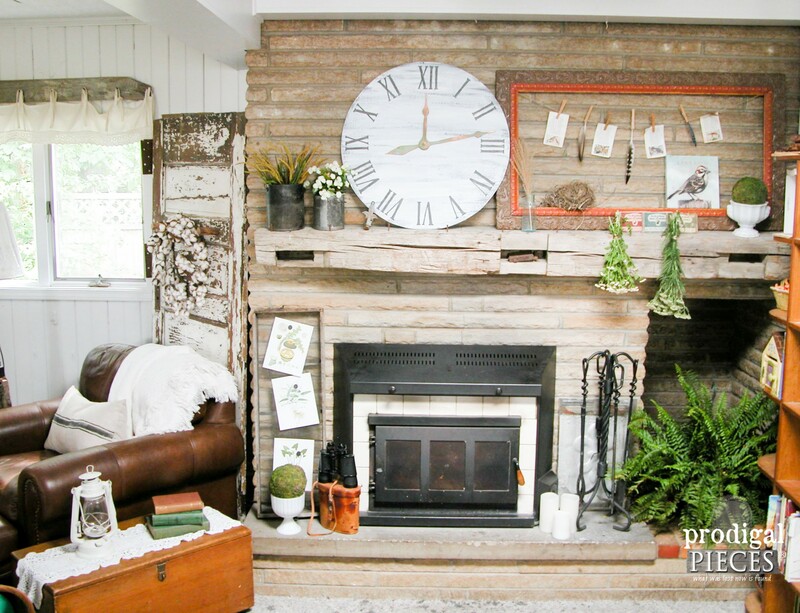 This room is next on our remodel list and I plan to work on the fireplace too. Congratulations on the book feature, Larissa! How exciting is that! You know how much I love a faux lock, having made one myself. 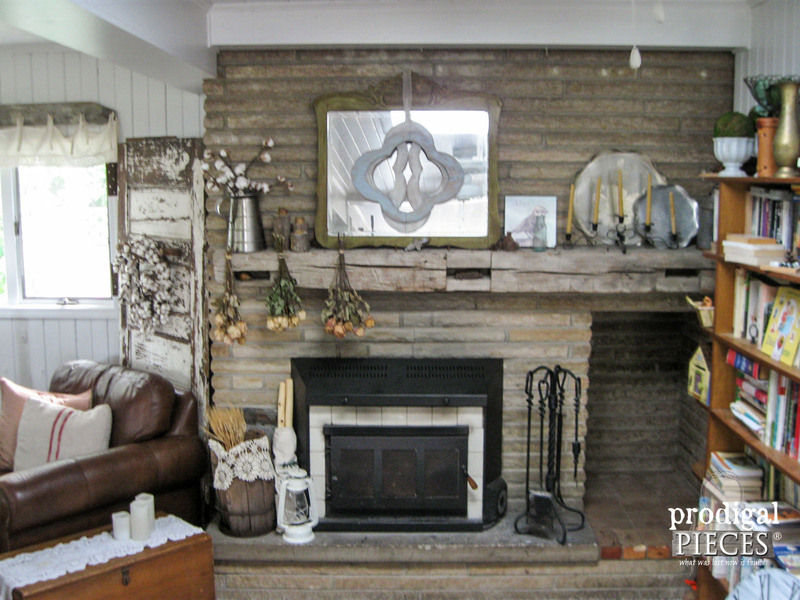 Love the patina on yours and it looks great on your rustic fireplace mantel!